Water activated tape is stronger, faster, and easier to use because it provides secure seals on items such as boxes and envelopes. 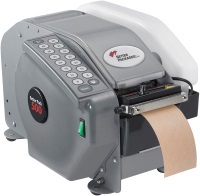 The BP500 electronic water-activated tape dispenser is powerful, efficient and simple to use. Its one-touch dispensing system can dispense reinforced and non-reinforced water-activated tape. This electric tape dispenser is Ideal for medium to high volume packaging needs.